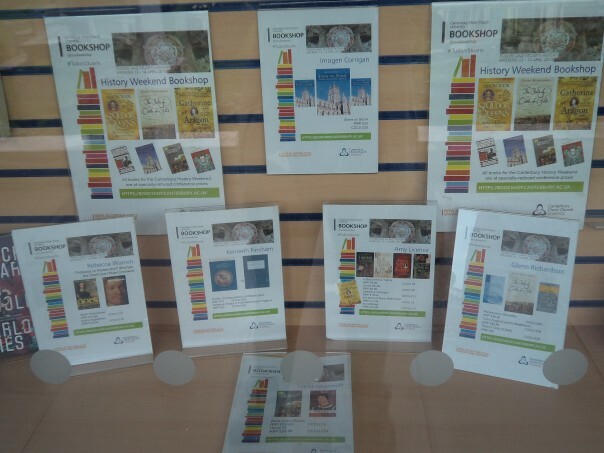 Last week I mentioned that we at the Centre had been out and about giving talks and conference papers, and to these I should like to add Professor Jackie Eales who has spoken recently to her home local history society at Bridge. Looking forward, too, there are several interesting talks coming up including a joint Centre and Friends of Canterbury Archaeological Trust [FCAT] lecture by Dr Andrew Richardson (CAT) on ‘Finds at CAT: amazing things and what to do with them!’ which will be on Thursday 18 October at 7pm in CCCU Newton Ng07. The following evening on the Friday I will be talking to the Oaten Hill and South Canterbury Association [OHSCA] on ‘People and places in late medieval Ridingate Ward’, but before these two lectures and although not linked to the Centre, I’ll just mention another talk with a Canterbury topic. The Canterbury Historical and Archaeological Society’s William Urry lecture this year on Wednesday 10 October at 7pm in Newton Ng03 will be delivered by Mary Berg, who will discuss ‘Thirteenth-century Canterbury: a charter, a seal and a gate’. Then, of course, there will be Michael Wood’s CCCU Open Lecture on Tuesday 30 October on ‘Why the Anglo-Saxons matter’ in Augustine House – booking via the CCCU Events webpage. Thus, October brings a host of goodies. Cllr George Metcalfe meets Jane Richardson and Lily Hawker-Yates. Moreover, this follows on from a pretty packed schedule in September that culminated this Tuesday in the 7th annual Michael Nightingale Memorial Lecture that took place at Old Sessions and attracted an audience well in excess of a hundred people, including some of the speaker’s colleagues from CCCU, and staff and students from the School of Architecture at the University of Kent. Among the audience, too, were many of the Agricultural Museum’s Trustees because the Nightingale Lecture is a joint venture between the Museum and the Centre. In addition, there were also people from Brook and Wye, as well as a healthy contingent from Canterbury, and we were also joined by a former Lord Mayor of the city, Cllr George Metcalfe. This meant there was an expectant buzz in the Old Sessions Foyer while people enjoyed the wine reception provided by the Centre before everyone trooped into the lecture theatre to hear Professor Peter Vujakovic. Having welcomed everyone, the first item on the agenda was the presentation of the Ian Coulson Memorial Postgraduate Awards. As regular readers of the blog will know, these Awards are named after a very good friend of History and Archaeology at CCCU. Ian Coulson was heavily involved with the first HLF funded project on medieval Folkestone in which one of the partners was CCCU. He was also the general editor of the Kent History Project for several years, was a charismatic teacher who could engage with all ages, had been President of the Kent Archaeological Society and Education Officer for Kent County Council – he is sorely missed! John Nightingales discusses his father’s role in the Agricultural Museum’s foundation. Of the three Award winners this autumn, two were present in the lecture theatre, the absentee being Rebecca Jarvis who lives in Lincolnshire, and who is working on members of the Kentish and Lincolnshire aristocracy in the 13th century. 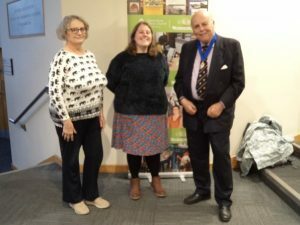 The intention had been for the presentation to be made by Professor Gillian Youngs, the Dean of Arts and Humanities, but she had had to withdraw late on Tuesday and very gallantly Cllr George Metcalfe kindly handed Award certificates to Lily Hawker-Yates and Jane Richardson. 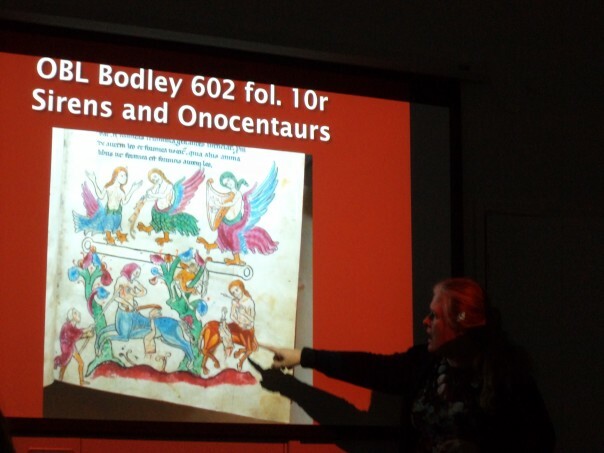 Regular readers of the blog will remember Lily who has just begun her third and final year studying medieval perception of prehistoric burial mounds in Kent. Jane is just starting her PhD research and will be investigating ‘The Little Dissolution’ of the 1520s in relation to Cardinal Wolsey’s actions again Tonbridge Priory and other religious houses in the area in his bid to establish university colleges. This was followed by Dr John Nightingale’s short address regarding why it is called the Michael Nightingale lecture. 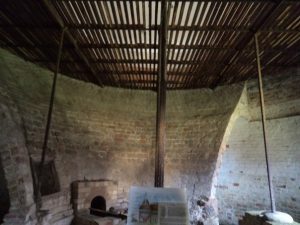 For John’s father had been the major driving force in the formation of the Agricultural Museum at Brook, with its fine collection of agricultural machinery and small tools housed in a magnificent late 14th century barn and very early round oast house. He also paid tribute to all the work of Dr Tom Hill, first as the Museum’s Honorary Secretary for many years, and latterly as an extremely active Trustee. Tom has now decided to step down, but he was at the Open Weekend taking visitors round the Museum a couple of weeks ago and this week was at the East Kent Ploughing Competition with the Museum’s stand. John included the role of Wye College in the formation of the Museum and it was Wye that Peter picked up on in his lecture. 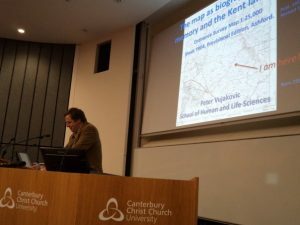 Peter Vujakovic examines ‘the map as biography’. 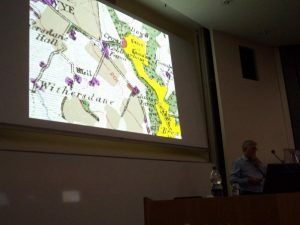 As a geographer, Peter has always been interested in maps, and he has used his maps of Wye and district for field trips taking students up onto the Wye Downs, as well as for his own use because this is very much his home area. Yet, as he said, professionally he is more comfortable with geopolitical maps of say South-East Asia but for this talk he wanted to introduce people to the concept of map as biography. Drawing on the work of scholars such as Brian Harley, he began by making the point that maps are not objective but are about power over landscape and people – “maps represent the world through a veil of ideology”. He demonstrated this by showing examples where military instillations ‘disappeared’ from certain maps, or where the language used to describe a feature might be seen as providing a veneer of order, a sense of the unchanging nature of the landscape. Such ideas can, of course, be linked to memory, for forgetting is just as important as remembering, and what is ‘forgotten’ can affect perceptions of the landscape over time. Peter discusses just how immersed you can become in maps. Moving on, Peter then mentioned the idea of the relationship between the social history of an area and its physical manifestation through the landscape, and maps of that landscape. Moreover, the sense of the personal as political becomes even more relevant when thinking about the map as a physical object – one of many in the form of a palimpsest, which in turn is linked to the map-makers, and thus the biography of the landscape and finally the biography of the user. For all of this Peter used his own experiences with the OS 1:25,000, Sheet TR04 map of Ashford that includes Wye, Brook, Wye Downs and the crown cut into the chalk. What might be seen as his ‘old friend’ guides him when he goes walking, alerts him to changes and offers a means of reflecting on the socio-economic, and thus political dynamics at work – such as a shift from a certain field being grazed by one person’s cattle to it being grazed by that of a collective. This sense of time depth through maps was something else Peter picked up on, using the concept of ‘taskscape’ as developed by Tim Ingold, who sees that “the landscape is constituted as an enduring record of – and testimony to – the lives and works of past generations who have dwelt within it, and in doing so, have left there something of themselves.” In addition to discussing his father’s arrival in Wye and his subsequent time there on one of the local large estates, Peter sought to illustrate this idea by examining the presence and role of Spider’s Castle. This family dwelling is now no more than a patch of hedgerow vegetation that extends into a field, but its ‘history’ can be explored in the cartographical traces on several maps, albeit exact sequencing is not a hundred percent clear. This cartographical ghost can open up discussions about changes in the rural economy – shifts from animal husbandry to arable, to increased mechanisation; to the loss of certain industries like brick-making; but also to the move of people from the countryside to the town; to the declining size of families – all aspects that are indeed local, but equally global in that maps of elsewhere are equally capable of showing such changes, as well as offering evidence of continuity. 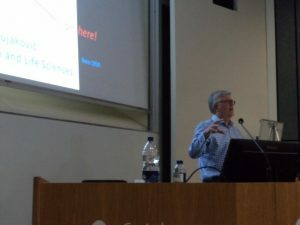 Moving on from man-made changes as evidenced through mapping, Peter then explored natural phenomena, his chosen example being the impact of the Great Storm of 1987 on the woodland of England’s southern counties. As he said, at the time people saw it as a mortal blow, a sense that nothing would ever be the same again as it affected something like 15 million trees, and that woodlands would disappear from the landscape (and maps). In some cases, this might be said to have happened, especially where fallen trees were felled and removed thereby making regeneration extremely difficult. However, where woods were too large to do this or where they were far less accessible 75% of the trees recovered and are alive 30 years after the storm, the woodlands seen on the map and in the landscape as Peter walks with his dogs – a testimony to this ongoing organic relationship. Peter finished by thinking about mapping for the future. In particular, he explored the world of the creative imagination of Russell Hoban, who has taken east Kent as his laboratory to fashion a society for the future where the hunter-gatherer is once more dominant, and where naming practices, as seen on his hand-drawn map, take on a slipperiness, a sense of fun and the absurd. Peter’s lecture brought extremely enthusiastic applause from his appreciative audience, a sentiment echoed by George Jessel, chairman of the Museum Trust, who gave the vote of thanks and revealed that almost all the land at Wye Peter had discussed was his as part of Jessel Farms. Consequently, he too has a strong affinity with this landscape and the maps that portray it. 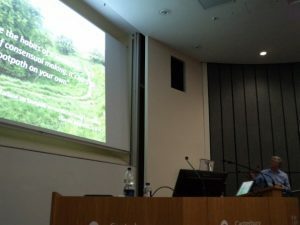 Having drawn the proceeding to a close and mentioned the Centre’s next event which will be the conference on Kentish naming practices in November, most of the audience left the lecture theatre, although a few came down to ask Peter specific questions. As a mark of their enjoyment, many of the audience gave generously to the voluntary retiring collection, and this money will be split between the Museum and the Ian Coulson Award fund.